THE DEATH OF BERTHA SCHULTZ WAS SWIFT, LEAVING LITTLE DETAIL TO TELL. THE DEATH OF HER MURDERER WAS NOT. ​IT HAPPENED IN PAWNEE CITY, BUT IT WAS REPORTED IN THE ARGUS AND THE MURDER IS SOMETHING THAT TABLE ROCK PEOPLE WOULD HAVE BEEN INTENSELY INTERESTED IN. BERTHA SCHULTZ AND FREMONT EMMONS WORKED AT THE EXCHANGE HOTEL IN PAWNEE CITY. SHE WAS A LAUNDRESS, HE A COOK. SHE TURNED DOWN his MARRIAGE PROPOSAL. what led up to that? HAD HE COURTED HER? Had THERE been A RELATIONSHIP in reality or only one in his mind? THE ANSWER HAS NOT SURVIVED. ALL THAT WE KNOW IS THAT HE MURDERED HER BECAUSE SHE HAD REFUSED HIM. Inscription on Bertha Schultz's tombstone in St. Peter's Evangelical Cemetery. This old cemetery is located on the Nebraska/Kansas line, on the Nebraska side. It's in South Fork Twp. 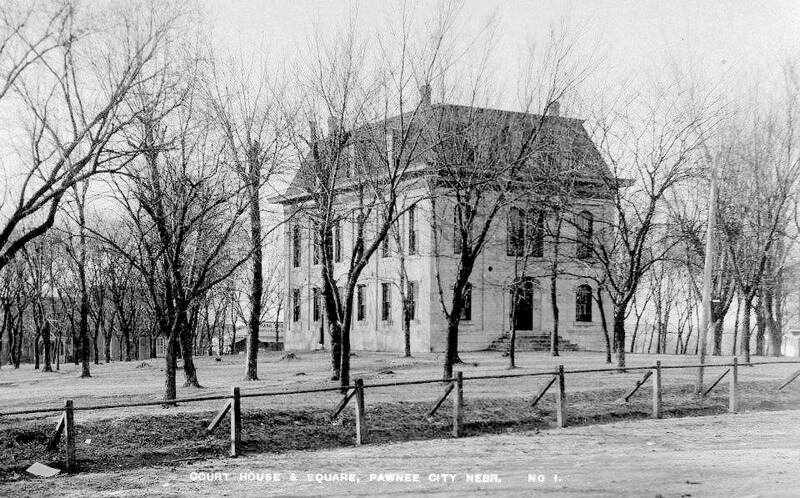 Sect.31-1-12 of Pawnee County, Nebraska. There was a little rock church here back then. The cemetery is just west of the intersection of 240 & H Rd. coming from Kansas. In 1888, Bertha Schultz and Fremont Emmons worked at the Exchange Hotel in Pawnee City. She was 25, he was 32, and both were single. He was a cook, she was a maid. He from was Pawnee City and she was from Dubois, a brand new little railroad town east of Pawnee City. Photo 915, shared by Historical Society member Jon Woods, a descendant of Joseph Woods, who built it in 1867. it was originally the Woods hotel. Emmons, according to one newspaper article reporting the crime, was a "good looking, intelligent man." We don't know what she looked like, but she was intelligent -- when he asked her to marry him, she refused. On July 26, 1888 -- it was a Thursday -- Bertha went to work as usual to launder clothes at the hotel. Emmons, too, went to work, taking with him a shoe knife that he had sharpened, as he intended murder. A shoe knife, or boot knife, is a small dagger with a hidden sheath in a shoe or boot. One later newspaper account called it a "shoemaker's" knife. Emmons quit work around Noon. He loafed around the hotel all afternoon. At about 7 p.m., he saw Bertha out in the yard of the hotel hanging out clothes. He went up to her. He grabbed her by the right arm. Fearing a lynching, authorities took Emmons to Beatrice. However, on July 31, they brought him back to Pawnee City for a preliminary hearing. That was the beginning of his own storied end. At least one newspaper referred to Emmons' death as a "suicide." One might say that, because the lynch mob told him to jump or he would be pushed. But we are getting ahead of a good story. Read on below. Sadly, we have no picture of Bertha, only of the man who murdered her. Leo James posted a photograph on Emmons' Findagrave memorial. This is an excerpt of it. ​"He was arrested and lodged in jail. Intense excitement and fear of lynching prevailed. The officers accordingly spirited him out of town," to Beatrice. He was brought back to Pawnee City for a preliminary hearing by the Pawnee County Sheriff, Sheriff Strunk, arriving in the afternoon. He was arraigned before Judge Belding and given a hearing. He pleaded not guilty. He "pretended to know nothing of the murder. He no doubt had determined to feign insanity." He was bound over to the district court and placed in a cell in the courthouse jail, which was in the basement. People were infuriated at Emmons' "effrontery in pleading not guilty to a charge so heinous and so clearly proven." small groups coalesce? a force arrives from dubois? 40 men enter the courthouse, 200 men? The earliest article, reported in the Pawnee paper the morning of Emmons' death, has the least detail. Within days, additional detail had been added. "Deputies Liebendorfer and Sullivan were arranging to take Emmons away [from Pawnee City], as an attack was feared at most any time, and had taken him out of his cell but found they were being closely watched and were afraid to risk starting out with him, so they determined to secret him in the courthouse, which they did." Great excitement prevailed during the afternoon and evening, and it became almost certain that justice would be meted out in a much speedier manner than through the courts. Groups of men, engaged in earnest conversation, could be seen on every corner. However, about midnight everything became quiet and all seemed well. "At about 2 o'clock in the morning, a mob from the vicinity of Dubois, the home of the murdered girl, entered Pawnee City and surrounded the courthouse." They entered, found Emmons, and proceeded into the streets with him. 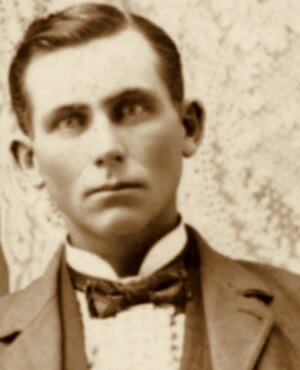 The first reports say merely that Emmons "was taken from the authorities at Pawnee City" and lynched. One article adds that the mob found the jail open and Emmons gone. They made a "thorough search" of the courthouse and found him is all one newspaper said. Another provided a little more information than that Emmons was "taken" from the authorities: "The guards were overpowered and the prisoner taken from them. He made no resistance." "The county attorney and a deputy sheriff noticing the danger, sought to elude the hungry mob by taking the prisoner to the third floor of the building. About 1 o'clock, forty masked men entered the building, and proceeding to the basement, found the doors of the jail unlocked and their bird flown. After making a careful search here they proceeded to the courtroom, which was in turn ransacked. Not finding him there, someone cried, "Look up on the third floor!" The mob broke down the door leading upstairs, and a mad rush was made for the landing, where they espied standing before them Deputy Sheriff Liebiendorfer, who commanded a halt. The command was obeyed for a second only. A rush for Emmons was made, and in a few moments he was dragged downstairs, a rope was put about his neck, and he was marched off in the direction of the Rock Island depot. Between 2 and 3 o'clock a.m., a body of almost 200 men marched steadily into the courtyard, two men being detailed as guards at each corner of the building. 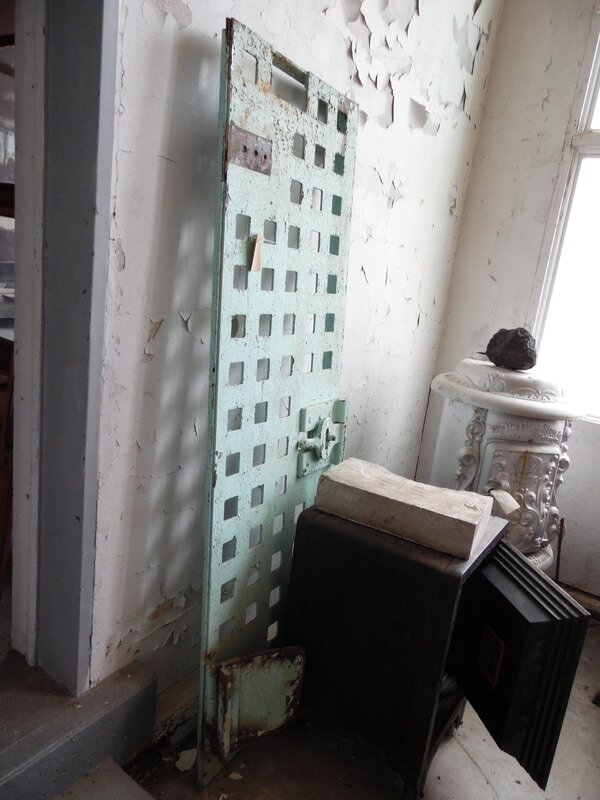 The jail door had been left open and the mob soon found it was empty, but were determined not be to baffled in their purpose and began a thorough search of the courthouse. They soon found their man, and a rope was immediately put around his neck. A rope was placed around his neck, and he was led through the public street to the high Chicago, Kansas and Nebraska trestle, over the Burlington and Missouri track. Arriving there the citizens asked that Emmons should be identified as the party wanted. The identification was completed. ​Near this depot was a wagon bridge over the railroad, to which they were first going to hang the victim. But owing to the protestations of citizens living near there they marched him to a railroad bridge spanning the B. and M. tracks. Here the rope was fastened to a tie. At left: This may be the bridge. Jeff Lantz posted this picture on the Facebook group page Pawnee County. Janette Kimes says that she believes this was "the" bridge. It was right behind her house and was taken down when she was little. Photo 6988. Other accounts were more detailed. In some accounts he confessed, in others he did not. "The prisoner confessed he had deliberately murdered the girl because she had refused to marry him." "He refused to say anything of the crime," "he neither admitted nor denied it." In some, he asked for a minister to come pray for him, in others the minister was sent for. In some, he spoke from the bridge, in one he was not on the bridge but was led out onto it after she spoke. He gave the history of his life for the past two years. He claimed to have been a Christian, but he lately had fallen from grace. He admonished the young men to reform from the habit of using strong drink. He also stated that he had been disappointed in love; that Miss Schultz had circulated false reports in regard to him, and maintained that he knew nothing about committing the murder. He asked if a minister was present and would pray for him, after which he asked to pray for himself. In his prayer he asked God to forgive him for committing the murder, and that God would forgive all those who were implicated in punishing him if they were guilty of any sin. Rising from his knees, he said, 'Boys, I will die like a man. I won't show the white feather. No, I am ready. Where is your leader?" With this the party started for the bridge, and the rope was finally tied to a beam, his hands pinioned, and he was told to step off. He said that if it was to step off or be pushed off, he chose the former. Feeling his way to the end of the bridge, he sprang off with a drop of about sixteen feet." Having finished [speaking and praying], Emmons was told to jump from the bridge. He refused at first, but when told he would be pushed off, he hesitated, then leaped into the space below. The drop was about twelve fee and his neck was apparently broken. He died without a struggle. The crowd quietly dispersed and left him hanging. He remained suspended until sunrise, and was then cut down and turned over to the undertaker to await the arrival of friends from Kansas. The lynchers were masked. The attending crowd comprised citizens of all grades. ​"The rope being tied around his neck and fastened to the bridge, he was commanded to jump. At the second command, Emmons made the fatal leap. His neck was broken. He scarcely made a struggle." "The job quietly dispersed, leaving the body hanging to the bridge." The Pawnee Republican article described the events and, in the headlines, referred to Emmons' death as "suicide." ​​One article had Emmons stepping off the bridge to his death and then being found by the coroner. There was actually a space of time, as Emmons' body was left "dangling." The coroner's jury apparently went out to the scene at sunrise. Their verdict: Emmons came to his death at the hands of parties unkown. The sentiment of our people generally is that the law should have taken the course, but that full justice was done the wretch. At this time, everything is as quiet as if nothing unusual had happened." ​One newspaper article claimed that the people of Pawnee City had nothing to do with the lynching. "The citizens of Pawnee had no hand in the affair, although many of them were silent witnesses at a distance." So, it was that Dubois crowd! The people of Pawnee City -- "many of them" -- just watched. At a distance. As one of their own was sent to likely perdition by vigilantes from Dubois. In any event, it is the only known instance of vigilante justice in Pawnee City. What of Bertha Schultz, what was lost to the world? Was Bertha Schultz a sweet girl, a lovely girl, a girl who had at one point been in love? Was she unhappy, joyful, spiteful, a loving daughter or sister? What would have become of her had she gone forward from age 25? How would the small world within she walked have changed? We don't know. We know only what is above. She was from Dubois, she turned Emmons' marriage proposal down, and he murdered her. So little to know about a life taken too soon. So sad that the manner of her death is the only knowledge of her that remains. Bertha is buried at St. Peter's Evangelical Cemetery by Dubois and Emmons is buried in the Pawnee City Cemetery. IN THE PIONEER MUSEUM, SITTING BEHIND AN OPEN SAFE AND NEXT TO A MICHIGAN POTBELLY STOVE IS THE JAIL DOOR FOR THE COUNTY COURTHOUSE. REPORTEDLY, THIS DOOR IS FROM THE CURRENT COURTHOUSE, WHICH WAS BUILT IN 1911. IT PROBABLY NEVER SAW A NIGHT LIKE THE ONE IN 1888 WHEN VIGILANTES CAME FOR THE MURDERER OF BERTHA SCHULTZ, A YOUNG GIRL WHO HAD DONE NOTHING MORE THAN REFUSE A PROPOSAL OF MARRIAGE.